I recently visited The Spider Web in Dania Beach. Part herbal apothecary, part tea bar, part new age education center, it's got a little bit of everything. The owners Sam and Debi couldn't be more inviting, and Debi happens to be from a town that neighbors the small town where my mother's from, so there's always good stories from childhood. Most excitingly, I got to see some some of Bettie Kruger's amazing altered artwork, although my purpose in visiting The Spider Web was to drink tea with friends. 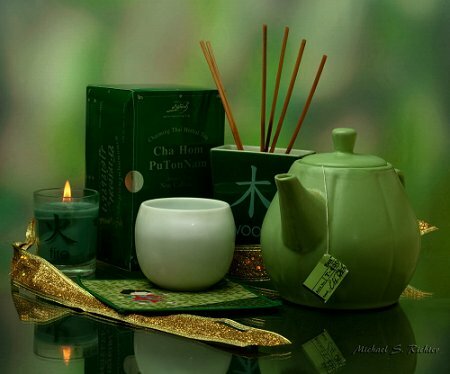 During my time in law school I began drinking tea as a form of meditation. I found the ritual of preparing the tea and taking slow, deep breaths as I drank it to be calming. As I sat at my dining room table every weekday, I would light candles, breathe in the steam and try to quiet my mind. I saw drastic improvements in my ability to focus and on my overall happiness. Back then I didn't consider myself to be a Buddhist, although I had many Buddhist beliefs. Nevertheless, it was the beginning of my meditation practice in my adult life. Although I don't necessarily drink tea every day now, I do still enjoy a good cup now and then. Sam from The Spider Web recommended his Samhain Blend recipe, which involves a super caffeinated tea called "rocket fuel" and some spices added. It was sooooo delicious, warming and enjoyable. I highly recommend The Spider Web as a great local tea spot and suggest that visitors ask Sam to make one of his signature recipes. What I love about the Spider Web is that it doesn't matter what your religious tradition is. Sam and Debi's establishment tends toward Wicca and pagan traditions, but they will accept a Buddhist, Christian, Catholic or anyone else, as long as you are respectful. I love it when you visit somewhere and you feel like you already belong. That feeling reminds me of something my friend Marshall said about the sangha. I once told him that I was having trouble finding a sangha. I had learned from Buddhism that people should take refuge in the Buddha, the dharma and the sangha, but what Marshall said to me changed my way of looking at Buddhism. Marshall told me that I didn't need to look for any kind of formal sangha; the sangha would find me or I could start my own. Since that time, I've looked at everyday life as an opportunity to increase the sangha, and have found like-minded people in some of the most unusual places, not only in Buddhist centers.